Weather/Conditions: Dry and cloudy in the morning. As soon as we arrived at the InPinn, relentless rain came in along with a big wind blowing up from Coire Lagan. Rough thereafter, then a bit damp all the way back to the car. We had an early start at Kintail - up for 6am, and out the door an hour later. As usual the drive to the Cuillin took and age via. Broadford, Sligachan and Carbost. As such, we were finally packed and ready to move just prior to nine. 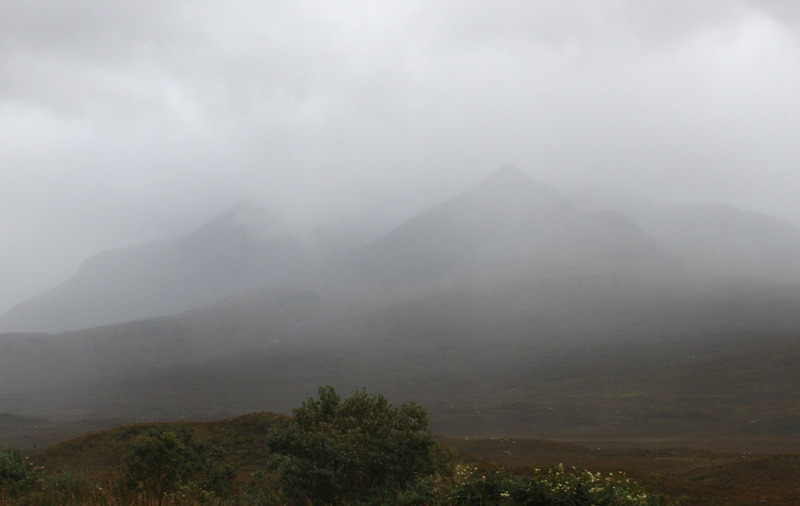 The Cuillin today were under cloud but at least it was dry, for the moment. 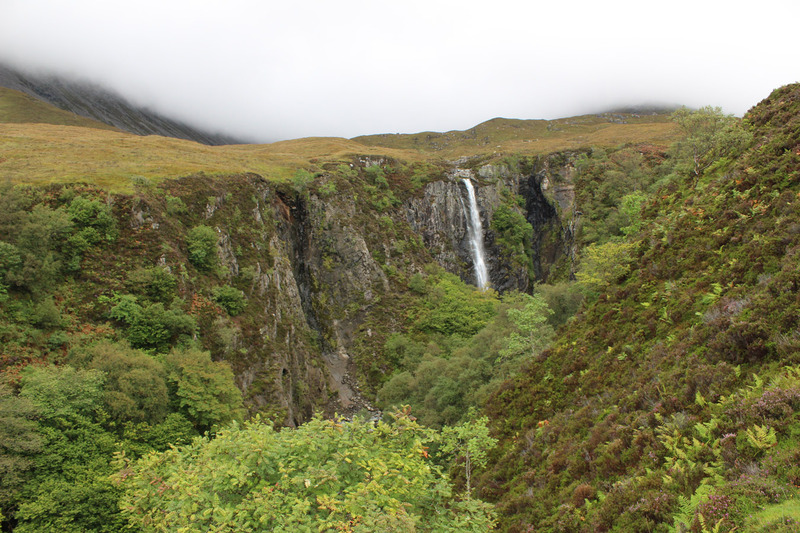 We headed up by the side of Eas Mòr, an impressive cleft and waterfall. 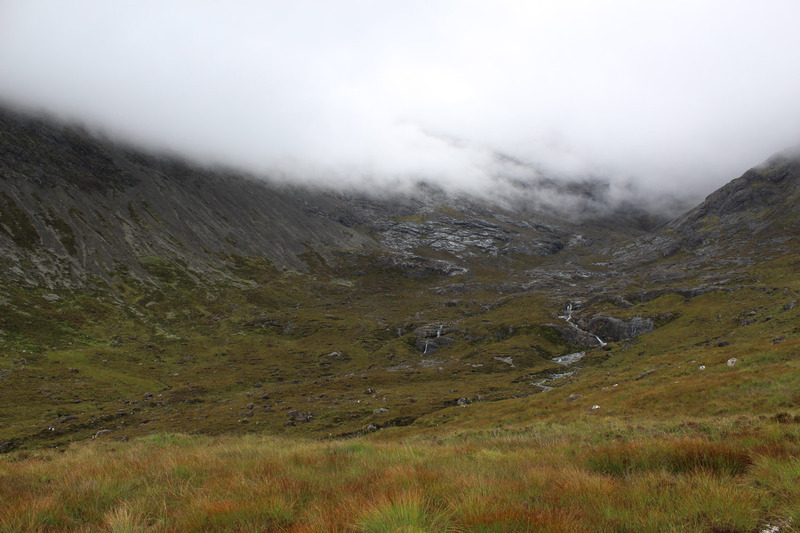 Coire na Banachdaich was shrouded in mist, damp gabbro slabs glinted in the light then rose higher to disappear from view. The Coire na Banachdaich route to the Cuillin crest is reasonably clear if you know what is coming. Without that help, it would likely be extremely disorientating. I see this might be my new challenge; getting the Cuillin in bad weather, just for the challenge! But often these coire routes are worn enough that the pale gravel suggests the areas of high footfall. A line of cliff bands on the coire headwall must be avoided, and a gully scores up one side of these. 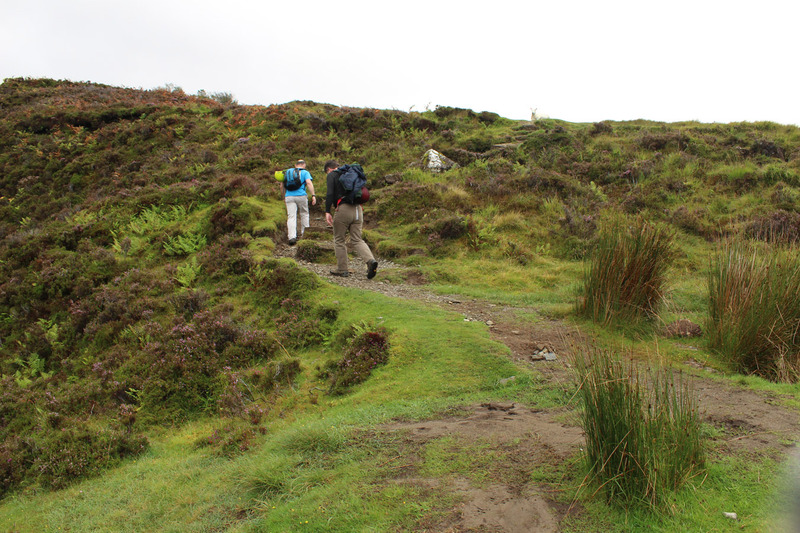 This is the route of ascent, but it is actually not much more than rough walking. Above this, I used a topo for navigation as maps are almost useless. We continued in the line of the lower gully, which opened out onto scree then steepened again to a continuation gully. This is a quicker way to get to the ridge than cutting left to Bealach Coire na Banachdich, but god it's loose. 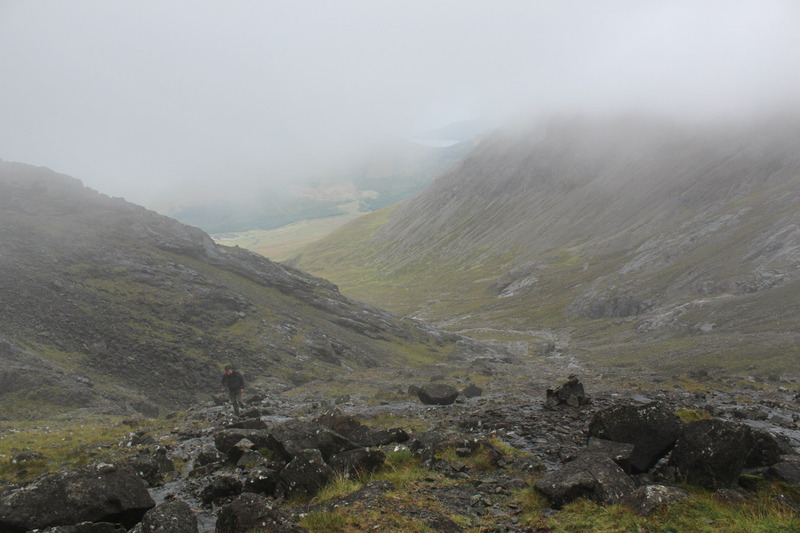 We wound up on the ridge crest in mist, with the summit Sgurr Dearg not far above, and just some scree climbing to get there. Strangely, the minute we put our heads over the edge and looked at the InPinn, the wind got up and and rain came on. I thought this was just due to arriving on the exposed side of the mountain, but it would transpire that the weather had actually gone downhill. 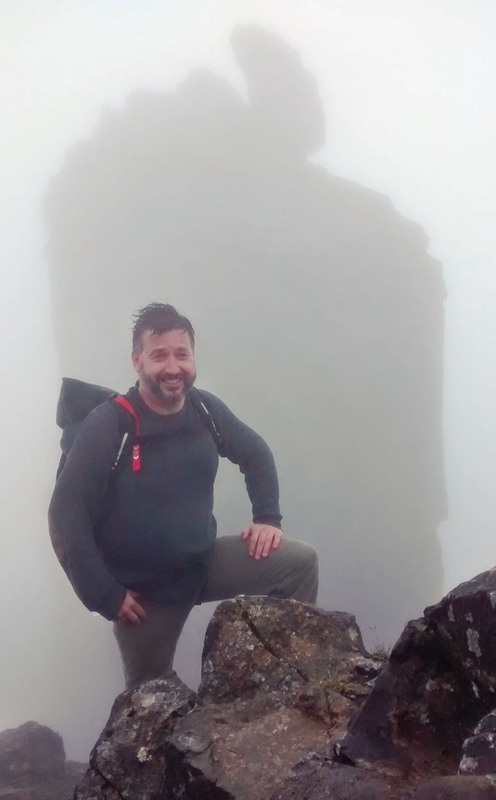 With no visibility, wet rock and a wind rocketing up from below, it was hardly ideal InPinn conditions. Steve and I went through the routine while Gordon waited. I suggested going to the bottom to see how it looked, but with conditions only getting worse, we called a halt there and then. Sgurr Dearg would have to do, but I'll go back to the InPinn with Steve for certain. Gordon harboured a plan to go to Sgurr na Banachdaich, a plan which we acted on at first. But with time getting on, a decision was made on the south ridge to head for the coire and get out. Which was probably just as well as Banachdaich would have added on a fair amount of time and the guys had to be getting home. 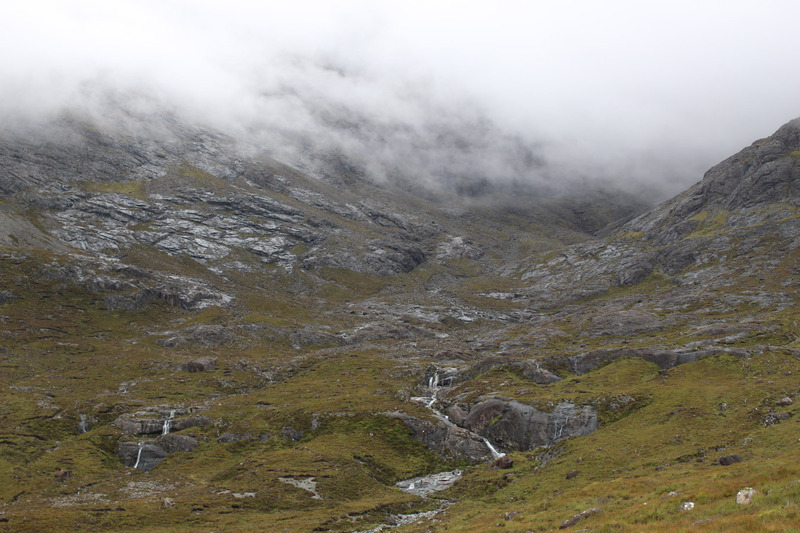 And so we walked out of the coire, with the drizzle falling and mist on the hills. We got back to the car moderately wet, but it certainly wasn't a washout. 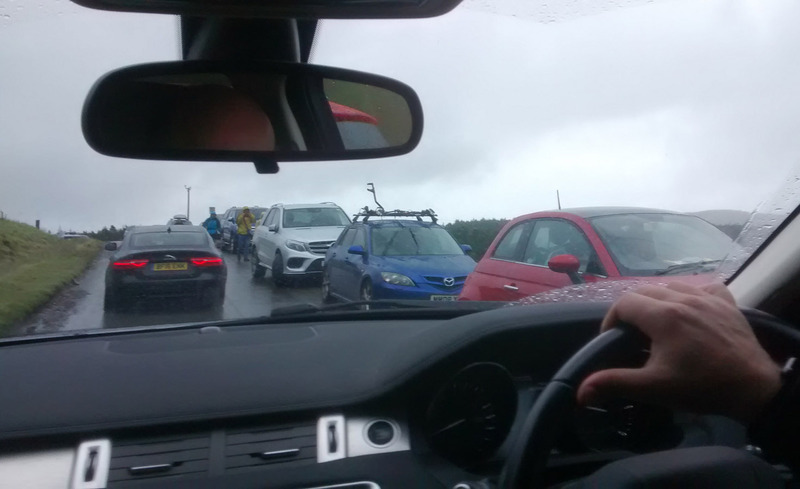 We got stuck in crazy Fairy Pools traffic on the Glen Brittle road, then Gordon dropped me at my car in Broadford. All in all, a good day to be on the hill for my birthday, the first time I think I've ever done that; I'm usually in Glasgow for it! I drove to Sleat for the second time this year to stay with dad in Ardvasar, who had just arrived from Glasgow for work. And the following day I consumed myself with Gaelic, finally getting home a couple days later.